Summary: Carat has been developed by a team of scientists from the UC Berkeley electrical engineering and computer science department’s Algorithms, Machines, and People Laboratory (AMP Lab). Don’t you wish there was an app that you could download to your iOS or Android device that could actually help you get more from your built-in battery? Now there is. Called Carat, this is the first app that can give you personalized battery life-saving recommendations. 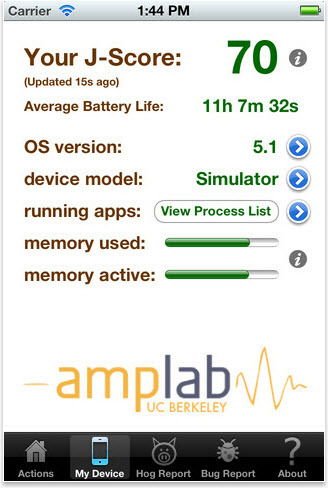 The app works by collecting metrics from your device and periodically sending them to the cloud in anonymized form. There they are combined with data collected from other users and what’s described as “cutting-edge algorithms” are used to number-crunch the data and come up with personalized steps to help you use less power. Carat will tell you which apps are battery hogs, and which are bugs — which also use up a lot of battery. Being a hog or a bug does not make an app ‘bad’, but a user trying to improve their battery life can use these designations to adjust their behavior. And before you start thinking that Carat is itself be a battery hog, it’s worth bearing in mind that it doesn’t need to run continuously in the background. You just have to run it periodically so it can send the data back to the servers and generate personalized recommendations for your particular device. Nothing that is collected identifies you personally. Carat has been developed by a team of scientists from the UC Berkeley electrical engineering and computer science department’s Algorithms, Machines, and People Laboratory (AMP Lab). The app is free and available both for iOS and Android devices. If this app doesn’t allow you to get satisfactory battery life out of your iOS device then I’ve compiled a list of battery saving tips that are guaranteed to help you squeeze precious minutes out of your device. These tips work for both the iPhone and the iPad.